We all love balloons, in fact, colorful balloons beautifully decorated to embrace your party event. Most of us prefer to use creative ideas to decorate party halls to looks like a beautiful and is one of the cost-effective methods of organizing a budgetary party without any hassle. Balloon Wall makes a perfect backdrop for your party stage or any centerpiece. Balloon wall is one of the best places where you can capture your amazing photos and jealous your friends, who remained absent from the party. Wow! What an excellent idea to create a Rainbow balloon wall impression. Buy some seven colors of balloons and inflate them to form an arc made of seven colors. This is one of the best party decoration ideas that would brighten up your party hall. If it is your birthday party, you can write a beautiful message on your birthday and decorate it using balloons. Make sure you write this message on the party stage and inflate balloons to cover the message area. Inflate red-color balloons and stick them to the wall giving a shape of a large-size heart. If it is your romantic wedding day, you can surprise your better half with this loving surprise. Create a stunning design using silk flowers and colorful balloons. Use attractive colors to divert the party guests’ attention towards your stage. This combination is quite easy to create. You just need to use creativity skills. Well, this sounds a bit crazy, but it is a perfect idea to click beautiful pictures of the events that you will organize your party. You can take colorful balloons of different shapes and sizes to create a beautiful balloon wall. If it’s your kids birthday party, you can write some beautiful lines using balloons to express your thoughts stunningly. Your children will love this idea and feel special on their special day. If you want to feel yourself on the Cloud-9, decorate your party wall using white-colored balloons. Standing in front of this wall will make you feel as if you are standing with your groom on the cloud. You can inflate balloons of different colors and attach ribbons at the base of the balloon. Now hang these balloons on the wall. If you want to give your guests a surprise blast, you can go for painted balloons. Paint your message over the regular balloon and hang it on the center table to create a balloon wall. to celebrate the years of your togetherness. Create a number wall using colorful balloons to show your guests the number of years you enjoyed with your partner. 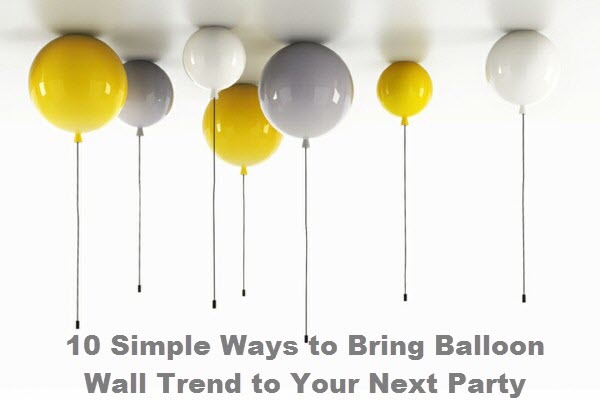 Above are the ten simple yet wonderful ways to decorate a balloon wall to your next party. Hopefully, you like these ideas and would consider them in future to throw a memorable party.